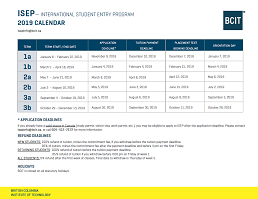 The International Student Entry Program (ISEP) is an academic English language program that prepares students for success in full-time studies at BCIT and enables them to meet BCIT English requirements. To learn about work permits after full-time programs, please contact the International Student Centre at isc_info@bcit.ca or visit BCIT International’s ‘Working in Canada’ page. How much does ISEP cost? *tuition fees are due 30 days before the start of your ISEP term. **Some ISEP courses require a textbook assigned by the instructor. Visit Cost & Supplies for more information on fee details. Visit Program Entry for more information on how to apply. PDFs of your official transcripts of secondary and post-secondary courses. These transcripts must be official and translated into English by a certified translator. This assessment is required to place you into the ISEP program. The test will assess your skills in writing, reading and listening comprehension, and your understanding of sentence structure. Test results are valid for six months. Note: If you already have a valid study permit, you may be eligible to apply to ISEP after the application deadline. Please email isepinfo@bcit.ca, or call 604-412-7672 for more information. Tuition fees are due 30 days before the start of your ISEP term. Tuition and other fees per term for continuing students is $2,756.90 CAD. All students must have medical insurance while attending BCIT. Medical insurance is provided through Guard Me (BCIT's student insurance providor) and costs $180 for three months. 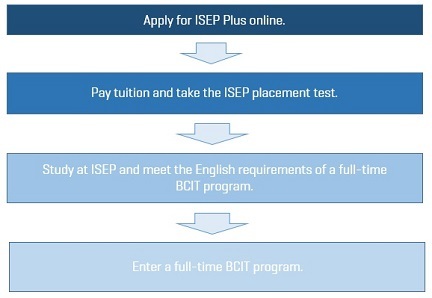 ISEP students can apply for BC MSP (Medical Services Plan), but must wait three months to be qualified. For more information, please visit Medical Insurance for ISEP Students. Application fee ($154), ISEP Placement Test fee ($120) and commitment fee ($1,000) are non-refundable. You may transfer the commitment fee to a full-time follow-up program only (must be accepted into the program within 12-months of your initial term start date). Part-time programs (course-by-course) are not applicable. You may defer your ISEP start date once within 12 months of your initial application. If you defer more than once, you will be required to re-apply and re-pay your $1,000 commitment fee. For information on what to do if your study permit application is denied, visit Fees: International Students: Study Permits. *New students withdrawing from their first term will have the $1000 commitment fee deducted from their total refund amount. Speaking 100 is an introductory speaking course designed to prepare students for Level 200. The course focuses on introducing students to routine communication skills, building cultural awareness and assisting students in gaining basic fluency and accuracy in their speech. In the course, students give a short presentation, ask and answer straightforward questions, provide basic descriptions and narrations, engage in simple social exchanges, and learn everyday polite forms. Listening 100 is an introductory listening course designed to prepare students for Level 200. The course focuses on introducing students to routine communication skills, everyday polite forms, and routine conversational exchanges. In the course, students practice answering straightforward questions, following short presentations, and understanding simple social exchanges such as apologies, warnings, instructions, and directions. Students also listen for grammatical items and begin to recognize stress and intonation patterns. This reading course is designed to prepare lower introductory students for Level 200. At the end of the course, students are able to identify, isolate and understand specific, predictable information and content in short, simple texts (maximum 1 page in length), such as short stories, short simple personal letters, postcards, advertisements, flyers, lists, menus, timetables, brochures, coupons, directories, everyday signs, descriptions, directions, instructions, schedules and warnings on familiar matters which contain the highest frequency vocabulary. Throughout the course, the students are given ample instruction and practice to recognize and identify specific information in short newspaper articles (maximum 1 page in length) describing events, and to begin to summarize texts in both written and oral form. The course also focuses on students' ability to apply pre-reading skills (using title, headings, and visuals to predict content, and activating background knowledge) to improve reading comprehension, and to scan texts to identify main ideas, as well as different types of clauses, word classes and simple connectors. Moreover, the course helps participants to use context to guess some new vocabulary and find more complex words in a dictionary. Students learn to recognize simple prefixes and suffixes, and comprehend and use new vocabulary from the General Service List (K1). Prerequisite: Level 0090. This writing course is designed to prepare introductory level students for Level 200. The students learn to write - with correct word order - short, simple texts, stories, invitation notes and messages relating to matters in areas of immediate need, relevance and interest, and use simple connectors like and, but, then and because to connect a series of simple phrases and sentences. Students also write - legibly - simple personal letters and notes (3-5 sentences in length) expressing thanks, apology, congratulations, get well wishes, goodbyes, sympathy and basic agreement/disagreement while beginning to demonstrate familiarity with everyday polite forms and the differences between formal and casual register. Furthermore, students learn to fill out simple forms, create simple questions with correct word order, write about family and describe people, objects, places, personal situation and events in 5-8 sentences. Throughout the entire course, learners are taught to apply basic self--diting and revision techniques. Students learn to take simple notes as a list of key points, identify topics of discussions, main points, key words and simple connectors in short presentations, listening and reading texts to create short, simple summaries. The course has a strong focus on accuracy with students receiving practice and instruction in the use of a variety of grammatical structures (see Grammar Outline). Upon completion of the course, learners are able to maintain grammar (simple, compound, and complex sentences: coordination), punctuation and capitalization accurately enough to be followed. Moreover, students know and can apply basic spelling rules for suffixes such as -s, -es, -ed, -ing, and they are able to write - with reasonable phonetic accuracy - short words that are in student's oral vocabulary. Prerequisite: Level 0090 or Placement Test. Speaking 200 is an upper introductory speaking course designed to prepare students for Level 300. The course focuses on developing students’ routine communication skills, building cultural awareness and assisting students in gaining basic fluency and accuracy in their speech. In the course, students give short presentations, carry out a straightforward survey, provide basic descriptions and narrations, and take part in simple group discussions and conversations on familiar topics. Listening 200 is an upper introductory listening course designed to prepare students for Level 300. The course focuses on developing students’ everyday communication skills, building cultural awareness, and introducing note-taking skills. In this course, students listen to short talks, discussions, and conversations on familiar topics, formulate simple questions, and summarize and paraphrase what they hear. This reading course is designed to prepare higher introductory level students for Level 300. At the end of the course, students are able to demonstrate comprehension of relevant information in straightforward texts, such as stories, narratives, descriptions, forms, letters, email messages, tables, graphs, diagrams, simple interview data, timelines, schedules, and brochures, on familiar matters which consist of high frequency everyday language. Throughout the course, the students are given ample instruction and practice to recognize significant points in straightforward newspaper articles - 1-2 pages in length - on familiar subjects, and to summarize and paraphrase texts (in simple fashion) in both written and oral form. The course also focuses on students’ ability to apply pre-reading skills (using title, headings, and visuals to predict content, activating background knowledge) to improve reading comprehension, and to skim and scan texts to identify main ideas, some supporting details, key words and phrases. Moreover, the course helps participants to identify ideas, some inferred meanings, facts, and writer's attitude stated in texts. Students learn to guess the meaning of some unknown vocabulary from context, recognize simple prefixes and suffixes, and comprehend and use new vocabulary from the General Service List (K2). Prerequisite: Level 100 or Placement Test. This writing course is designed to prepare higher introductory level students for Level 300. The students learn to write short, straightforward connected texts on familiar subjects, such as personal stories, by using and linking simple, compound and complex sentences into a linear sequence. Students also write short, personal letters describing a person, object, place, situation, event, experiences, reasons, problems, feeling and events in some detail, and expressing and responding to invitations, thanks, and basic agreement/disagreement, regrets, cancellations, and apologies while beginning to demonstrate familiarity with cultural awareness and differences between formal and informal register. Furthermore, students learn to fill out simple forms and write notes and emails giving news and relating to matters in areas of immediate need and relevance. Throughout the entire course, learners are taught to apply basic self-editing and revision techniques, as well as paraphrasing in simple fashion. Students learn to take simple notes as a list of key points, identify main points, some supporting details, key words and phrases in short presentations, listening and reading texts to create short, coherent summaries. Towards the end of the course, students learn to identify structure and coherence in paragraphs and then begin to write simple narrative and descriptive paragraphs. The course has a strong focus on accuracy with students receiving practice and instruction in the use of a variety of grammatical structures (see Grammar Outline). Upon completion of the course, learners are able to maintain grammar (simple, compound, and complex sentences: coordination, subordination in cause & effect, opposition, and condition), spelling, capitalization and punctuation accurately enough to be followed most of the time. Prerequisite: Level 100 or Placement Test. Speaking 300 is an intermediate academic speaking course designed to prepare students for Level 400. The course focuses on refining students’ routine communication skills, building academic awareness and assisting students in attaining a greater degree of fluency and accuracy in their speech. In the course, students give a variety of presentations, carry out a straightforward survey, and participate in structured group discussions on familiar topics. Listening 300 is an intermediate academic listening course designed to prepare students for Level 400. The course focuses on improving students’ formal communication skills, building academic and cultural awareness, and developing effective note-taking strategies. In this course, students listen to short lectures, interviews, discussions, and broadcast audio material, formulate simple questions, and summarize and paraphrase what they hear. This academic reading course prepares low intermediate students for ISEP level 400. At the end of the course, students are able to demonstrate comprehension of straightforward factual texts, some of which follow the rhetorical functions of cause/effect and compare/contrast. Throughout the course, students practice skimming and scanning texts to identify content, main ideas, important/supporting details, topic and concluding sentences and key words. The course also focuses on students’ ability to identify the rhetorical functions of cause and effect and compare and contrast, and to use note taking methods appropriate to these functions. Students learn to summarize and paraphrase reading texts in both written and oral form, and also begin to develop strategic reading strategies, through prediction, summary, clarification and questioning, to learn a complete approach to the comprehension of any text. Critical thinking skills are also introduced as students begin to identify facts and opinions in texts. Students learn strategies to guess the meaning of unknown vocabulary from context, to understand word forms, and to comprehend and use new vocabulary from the Academic Word List. Students increase exposure to Academic Word List Sub-lists 1-2 through systematic practice. Grammatical awareness is developed through analysis of grammar in context, and reading rate is also practiced to increase reading fluency. Writing 300 is an academic writing course in which students learn how to develop an argument in various paragraph structures. The course focuses on all aspects of the writing process and requires students to outline and edit their work. Students will also learn to paraphrase information and work to attain a higher degree of grammatical accuracy. Prerequisite: Level 200 or Placement Test. Speaking 400 is an upper intermediate academic speaking course designed to prepare students for Level 500. The course focuses on introducing students to formal communication skills, building academic awareness and assisting students in attaining a greater degree of fluency and accuracy in their speech. In the course, students give a variety of formal and informal presentations, design and conduct a survey, and participate in structured group discussions on simple topics that are relevant to BCIT programs. Listening 400 is an upper intermediate academic listening course designed to prepare students for Level 500. The course focuses on refining students’ formal communication skills, building academic and cultural awareness, and developing effective note-taking strategies. In this course, students practice evaluating, summarizing, paraphrasing, and formulating questions while listening to longer lectures, presentations, reports, and discussions. This academic reading course prepares intermediate students for ISEP level 500. At the end of the course, students are able to demonstrate comprehension of texts of approximately 4-6 pages in length, mostly relating to business and technology subjects and to students’ areas of interest and speciality. Throughout the course, the students develop reading strategies, develop critical thinking and adapt their speed of reading to different texts and purposes. Students skim and scan texts to identify content, main ideas, important/supporting details and key words. The course also focuses on students’ ability to identify the functions of cause and effect, and compare and contrast. Students develop summary writing and orally paraphrase texts. Students learn strategies to guess and determine the meaning of unknown vocabulary in context, and to recognize roots, prefixes and suffixes in order to comprehend and use new vocabulary from the Academic Word List Sub-lists 1-4. Grammatical awareness is developed through analysis of grammar in context, and reading rate is continually developed to promote reading fluency. Prerequisite: Level 300 or Placement Test. Writing 400 is an academic writing course in which students review paragraph structures and learn to write clear 4-5 paragraph essays. The course focuses on all aspects of the writing process and requires students to support ideas, use appropriate register, and show cultural and academic awareness. Students will also develop stronger paraphrasing skills and work to attain a higher degree of grammatical accuracy. Prerequisite: Level 300 or Placement Test. Speaking 500 is an advanced academic speaking course designed to prepare students for Level 600. The course focuses on developing students’ formal communication skills, building academic awareness and assisting students in attaining a high degree of fluency and accuracy in their speech. In the course, students give formal presentations, design and conduct a survey, coordinate on group projects, and participate actively in structured group discussions on complex topics that are relevant to BCIT programs. Listening 500 is an advanced academic listening course designed to prepare students for Level 600. The course focuses on refining students’ formal communication skills, building academic awareness, and developing effective note-taking strategies. In this course, students listen to a variety of genres, including presentations, speeches, lectures, and broadcast audio material, mostly related to business and technology, and practice identifying main ideas, making inferences, and taking well-organized notes. This academic reading course prepares lower advanced level students for ISEP level 600 and/or for post-secondary studies at the British Columbia Institute of Technology. At the end of the course, students are able to demonstrate comprehension of complex texts of approximately 7-8 pages in length, mostly relating to business and technology subjects and to students’ areas of interest and speciality. Throughout the course, the students apply reading strategies to academic texts, develop critical thinking skills and synthesize information from multiple sources. Student will construct notes based on the text type, begin to annotate text and generate summaries and critical responses of source texts. The course also focuses on students’ ability to identify the functions of expository and persuasive texts, and to understand how grammar is used in academic texts. Students continue to develop strategies to determine the meaning of vocabulary from context, and comprehend and use new vocabulary from the Academic Word List Sub-lists 3-7. Writing 500 is an academic writing course in which students review basic essay structures and then learn to use sources and proper citations to support their arguments in essays of approximately 700 words. The course focuses on all aspects of the writing process and requires students to support ideas, use appropriate register, and show cultural and academic awareness. Students will also develop stronger paraphrasing and summarizing skills and work to attain a higher degree of grammatical accuracy. Speaking 600 is an upper advanced academic speaking course designed to prepare students for study in BCIT programs. The course focuses on refining students’ formal communication skills, building academic awareness and assisting students in attaining a high degree of fluency and accuracy in their speech. In the course, students give formal presentations, take part in debates, coordinate on group projects, and participate actively in structured group discussions on complex topics that are relevant to BCIT programs. This advanced academic reading course prepares ISEP 600 level students for post-secondary studies at the British Columbia Institute of Technology. At the end of the course, students are able to demonstrate comprehension of complex academic texts. Throughout the course, the students apply reading strategies and critical thinking skills to these complex texts to generate critical responses. Students refine their reading skills, locating relevant details to decide whether closer study or consulting secondary/additional sources is worthwhile. The course also focuses on students’ ability to synthesize information quickly from multiple sources, and to generate summaries in written and oral form. Students analyze genres, rhetorical functions and the grammatical features of academic texts. Students apply vocabulary strategies to determine the meaning of vocabulary from context, and to comprehend and use new vocabulary from the Academic Word List Sub-lists 5-10. Writing 600 is an academic writing course in which students review how to evaluate and cite sources and then search for appropriate sources to use in a research paper. Students will learn to write an annotated bibliography and a rough draft in preparation for this essay. The course focuses on all aspects of the writing process and requires students to support ideas, use appropriate register, and show cultural and academic awareness. Students will also work to attain a higher degree of grammatical accuracy throughout the course. Prerequisite: Level 500 or Placement Test. The program length is between 2 months and 12 months. It depends on the level at which a student starts ISEP. ISEP students have free access to the Study Center and Peer Writing Tutor, counsellors, and program advisors. ISEP is located at BCIT’s Downtown Campus (DTC) in Vancouver. See Contact Us for more information. ISEP classes are 25 hours a week. 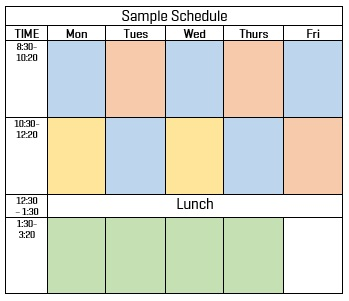 A sample schedule is below, but actual schedules may differ. ISEP students study four courses: Speaking, Listening, Reading and Writing for a total of 25 hours a week. Each course has 6 levels (100-600). The program length will vary depending on the student's initial proficiency level, as determined by the ISEP placement test. Education: B. Comm. (University of British Columbia); M. Ed (Simon Fraser University); CELTA (Cambridge). Education: B.Sc., M.Sc., B.Ed., Ph.D.
"ISEP has a very useful curriculum and great instructors for international students. ISEP courses are academically challenging and require intensive work, so it keeps students working hard all the time. The instructors always encourage and lead me to achieve my goals. As a result, I can see that my English skills have improved a lot and I have gained more confidence in reading, writing, and also speaking English. I am looking forward to entering my major in ECET at BCIT!" Complete ISEP and meet the English requirements for one of these full-time programs that accept international students. Seats in full-time programs are limited, and even if you meet all the entrance requirements before the application deadline, acceptance may not be guaranteed. Conditions of acceptance depend on the program you chose. Please contact the International Student Centre directly to discuss application details for your follow-up program: isc_info@bcit.ca.